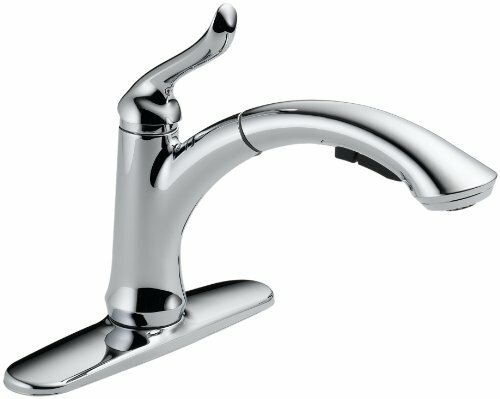 When it comes to Pull-Out faucets, Delta has a unique model that is very well known in the market. 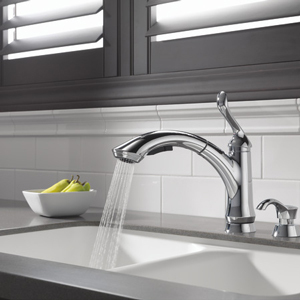 We’ve summed up all the details of Delta Linden Faucet in this post. Enjoy your reading! 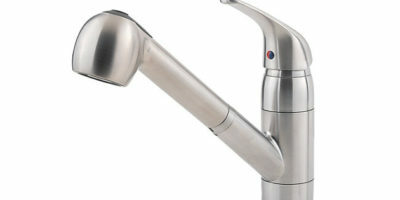 The visual design of this pull-out delta faucet, particularly in terms of its finish, serves as perhaps the perfect example of chrome making for a better-looking finish than stainless steel. Where stainless steel characteristically gives off a more fluorescent sheen, which in some natural-light filled kitchens results in an ‘unnatural’ type of glare, the chrome finish and color profile of this faucet give it a more matte look. 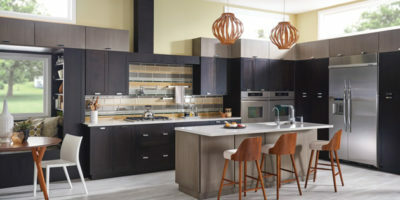 In deployment, this makes it look good in any kitchen setting with just about any interior design style, which is perhaps why it’s rather astutely classified to have a transitional style in itself. The base material is metal, a rather natural base for a chrome finish since the materials almost look the same in their purest state of refinement. 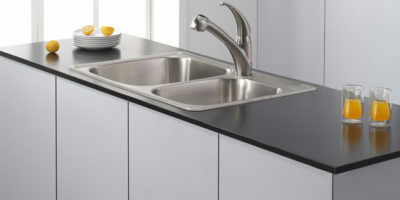 It seems to have been the perfect choice for the manufacturers and designers to go with a chrome finish over a polished chrome one, which one would imagine would have limited the faucet’s integration to only those kitchens which have a more modern, contemporary or ultra-modern / minimalist profile. So basically this is a more basic and accommodating design, which the manufacturers claim to have been given its inspiration by a strong in nature presence. 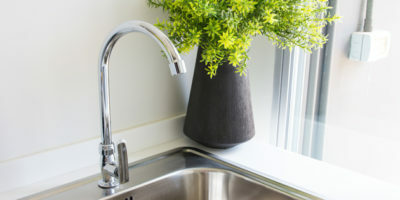 That’s probably why this faucet just seems to work really well mounted on a kitchen sink unit which has a big window over it, overlooking the flora-filled outdoors. You could very well install one in an outside basin, sink or water feature if you weren’t worried about something like theft. Three holes come together to deliver a water flow rate of 2 gallons per minute, while the operation is smooth and easy with one handle. This is a very water-efficient faucet and it has a built-in multi-flow feature which can be set to deliver just 1.5 gallons per minute if required. The spout is 8 inches in height and 10 inches in length and you can go for the optional 10-1/2 inch escutcheon if there’s a need. Installation is as easy as pie here, despite the unit weighing 6 pounds and measuring 9.9 x 10.5 x 99 inches. It’s a deck-mounted installation for direct mounting onto the sink or counter-top and all the required mounting hardware is included. The novelty of using this faucet once it has been fully installed never really wears off. It’s like rediscovering it every now and then whenever you use it again, which would perhaps have otherwise been a cause for concern since the best functionality-design is that which allows you to use whatever it is you’re using without having to put much thought into the actual action. That is meant in a good way in this regard, however, because what you’re only really constantly reminded of is step-up in features, comfort, and functionality associated with using this Delta pull-out faucet over any other one which you may have replaced with it. It’s a definite upgrade and we’d go as far as saying it would be an upgrade on the majority of kitchen faucets out there, even some of those which have been produced after this one was released. So what you get is the performance with no leaking and the spray is really good too. The spray has a bit of a ‘commercial’ feel, you know like what you’d expect of a faucet used in a bar, restaurant or some other commercial establishment along those lines. This simply means that it’s a quality spray that feels solid and performs just as well when you’re doing house chores such as washing stubborn grime and grease off of your pots and pans. It looks good too with the design transcending functionality and going all the way back to visual appeal, which is naturally something you’d want out of one of the most important pieces to be installed in a domestic kitchen. If you look at the faucet or even operate it, you won’t notice that the spray is actually made out of plastic. You’ll actually even have to tap something against it to notice that it’s plastic. The sprayer being plastic is quite hard to link with any functionality flaw or advantage, however, but perhaps the fact that the faucet doesn’t reset to the water stream is one such link. While this could never be an advantage, it certainly isn’t really a flaw either because even though it doesn’t reset to the water-stream, there are still no leakages. This is a long-lasting faucet – a truly long lasting one which retains water without any leakages for as long as we’re aware of. The matte appearance of the chrome coating surprisingly doesn’t really stain either, another reason why chrome proves to have been a better finish over stainless steel. This makes it easy to clean (wipe) if you ever have to that is. Faucet Mag Copyright © 2019. © 2015-2018 Faucet Mag. All Rights Reserved. faucetmag.com is a participant in the Amazon Services LLC Associates Program, an affiliate advertising program designed to provide a means for sites to earn advertising fees by advertising and linking to amazon.com.